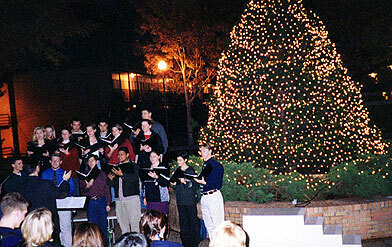 The 2000 holiday season at Sam Houston State University was kicked-off on Thursday, November 30 with the celebration of the Tree of Light, sponsored by the Program Council. 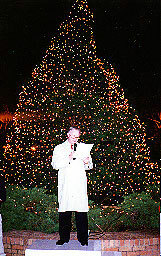 The university celebrated this 80 year old tradition that took place in front of the administration building with President Bobby K. Marks as the featured speaker. The bright lights of this candlelight ceremony and the sweet sounds coming from the choir made for a welcome beginning to the winter holiday season.